I did some searching on the Internet and found an old trick for the eTrex basic edition to get into diagnostic mode,... which didn't work on my Venture model. But I found out how to do that with a Venture (and Legend most likely too). Note: I you discovered some cool "features" then please let me know (mail me). Hold Up and Page pressed while powering on the unit. As a main feature you will notice an internal thermometer (accurancy 1°C). It shows internal temperature of eTrex. Pressing "page" button, you can pass through complete display check and functions of all buttons could be tested using icons in bottom part of screen. OK, cool,... but that trick didn't work with the Garmin eTrex Venture. Tip: Pressing "up"+"enter" keys while powering up the eTrex will reset the eTrex to factory defaults. So, all pressets and data will be lost. For Garmin eTrex Legend, Vista and Venture owners, a similar feature is available. (Thanks to Mike for the confirmation on the Vista). Press and hold the "stick" while powering on the unit. Update: this trick works also with the color version of the Vista, the Vista-C. I asume the LegendC will do this too. Garmin released a little tool called xImage which allows you to get/put to your GPS, like screenshots for example. A screen appears showing lot's of usfull info, but best of all: the thermometer (red arrow)! Usefull info would be the software version (do I need an update? 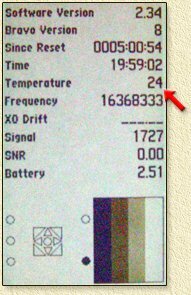 ), temperature (appears to be in degrees Celcius on my eTrex) time, and battery voltage level (2.51 V). Pressing each of the buttons of your eTrex, will indicate if it's working OK by display a representation in the lower left corner. Press the "Page" button twice, allows you to flip through some of the screen diagnostics. Use the stick to change contrast during these tests. I have seen this work on both the Vista and the Vista-C.
For some eTrex model (confirmed to work with the eTrex Vista, and confirmed it does NOT work with the eTrex Vista-C): Goto the "Trip Computer" page. Click the "Zoom Out" button, the "Zoom In" button, and the "Zoom Out" button again. Your eTrex now shows the Internal Diagnostic Reports.